Author Lisa Vihos at I.D.E.A.S. Academy with the poster made by high school students in Stuart Howland’s graphic design class. Poetry is not revolution, but a way of learning why it must come. In the summer of 2015, I traveled to Salerno, Italy, for the inaugural confer­ence of 100 Thousand Poets for Change (100TPC). Eighty poet-organizers came from across the globe—Egypt, India, Ireland, Israel, Italy, Macedonia, Malaysia, Mexico, Nigeria, and the U.S.—to share experiences, learn from each other, and discuss how to better employ poetry as a catalyst for positive change in a troubled world. California poets Michael Rothen­berg and Terri Carrion began 100TPC in March of 2011 as a way to bring together “poets, musicians, and artists around the USA and across the planet in a demonstration/celebration to promote peace and sustainability.” They called for “serious social, environmental, and political change,” and put forth the idea that poetry can play a unique role as both organizer and messenger for social change. Their message resonated with me during that difficult winter of 2011 when our state was gripped by a deep cultural divisiveness and rancorous political discussion. I signed on to 100TPC to start my own chapter in Sheboygan. Every September since 2011, with support from Mead Public Library, I.D.E.A.S. Academy, North High School, and a team of local and regional poets, our Sheboygan chapter has offered an open mic reading for anyone who wants to add their voice to the movement for social change. Every year the audience has gotten a little bigger—we’ve gone from 20 people to more than 85 in our five years—while participation in 100TPC worldwide has grown over time to include over 600 communities in more than a hundred countries. My goal with the Sheboygan event has always been simple: to invite people of all ages and all walks of life to come together—poets and listeners alike—to share their thoughts about the world, to become aware that poetry does have something to say to us, to learn why poetry matters. In Italy I met poets who use video, publication, performance, education, social media, and other vehicles to get poetry out into the world. My 100TPC colleagues and I ate lots of pasta, had lengthy discussions about the oral tradi­tion, and walked the streets of Salerno reciting poems. The experience was both educational and inspiring. Having bonded with so many amazing poets so far from home, I vowed that I would return to Wisconsin and do more to reach out to my 100TPC cohorts here. 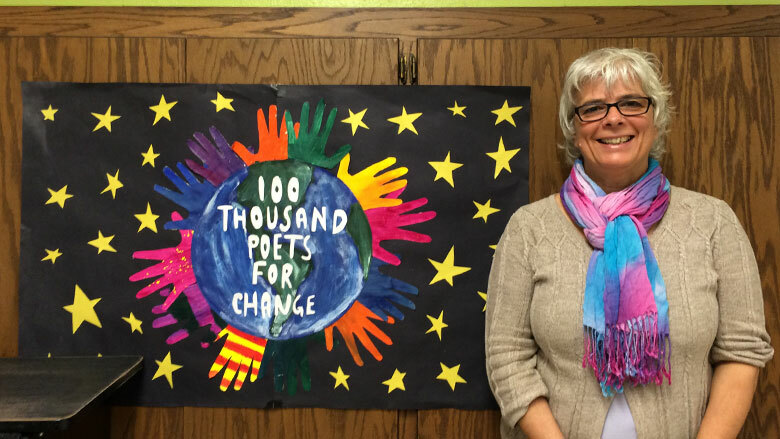 In so doing, I have learned that while not everyone works under the name “100 Thousand Poets for Change,” or considers their poetry to be activist in nature, poets across the state use their words to light the way to a more peaceful, just, and sustainable Wisconsin and world. I write to encourage, inspire, and remind. In my conversations and e-mail exchanges with Wisconsin poets, I learned that those who seek change through poetry take many different approaches. In addi­tion to producing their own work, some poets teach, some start collectives or reading series, some publish the work of others, some bring poems onto busses or into common council meetings. In Wisconsin, there are poets addressing particular, targeted issues, and some are working more broadly to give voice to the voiceless. Why use poetry to bring about social change? Can poetry really succeed at such an endeavor? The series draws on the power of poetry to bring to our attention situ­ations, places, and relationships with awakened, enlightened eyes. Unlike a speech or testimony, poetry operates on another plane of discourse, employing metaphor to reach beyond what is expected, revealing the familiar in new and startling ways. If politicians twist words, then perhaps poets untwist them. Poets unravel the mysteries of words into many possible truths. Poets look for paths out of the darkness and transport the listener or the reader into unexpected places. I love to hear a young person say, "I saw this poet and it changed my life." In order to convey messages of change to broader audiences, poets need not only ensure that more people are listening, they must also encourage more voices to contribute the song. Many poets are doing just this by creating new avenues for people who might never before have thought of themselves as poets. Milwaukee poet Angie Trudell Vasquez has been on the staff of the American Civil Liberties Union in Milwaukee for ten years, and she sees how important the ACLU’s annual Youth Social Justice Forum is for the city’s students. Students gather from all over the city to learn about social activism and how to advocate for change in a wide array of workshops, including Vasquez’s session in which she uses poetry to teach about the past, present, and future in the effort to build confidence and purpose in young people. Vasquez contrasts our constitution­ally guaranteed freedom of speech with oppressive regimes that torture and murder artists who speak out in protest. She exposes students to a variety of different styles and poets, then encour­ages the kids to make and share their own poems. Poetry touches and changes lives, even those lives that are mostly unseen. For the past three years former Wisconsin Poet Laureate Bruce Dethlefsen (2011–2012) has been volunteering to teach poetry in three state correctional institutions in Central Wisconsin (Fox Lake, New Lisbon and Red Granite) with his poet-comrade Bob Hanson, a retired Lutheran minister and Buddhist teacher. They bring writing prompts and an open ear for the pris­oners to make and share their own poetry, which is always followed by grateful applause. In April 2016, Rozga, Vasquez, and McKee will head to Washington DC with UWM’s Portia Cobb to present at Split This Rock, a biannual poetry festival and conference that highlights the connections between poetry and social justice. Their panel discussion, “Poetry on the Move: Engaging New Readers and Writers,” will provide strategies for gener­ating and presenting poetry in schools, prisons, and community-based work­shops, and identify ways to keep these experiences alive through print, perfor­mance, and multimedia. Sometimes, poets rally around one very specific issue. For poet Rob Ganson, who lives west of Washburn not far from the shore of Lake Superior, that issue is water. His work as a poet-activist over the past few years has revolved around a collaboration with Mike Wiggins Jr., tribal chairman of the Bad River Band of Lake Superior Chippewa, to fight the devel­opment of an iron ore mine in northern Wisconsin. Proposed by Gogebic Taconite, the mine was to encompass a 22,000-acre strip of the Penokee Hills containing 71 miles of rivers and streams that empty into the Bad River and, eventually, Lake Superior. It would have been the largest open-pit iron ore mine in the world. that scour the earth for iron and gold. During Gogebic Taconite’s applica­tion phase for the mine, local musicians created songs lamenting the destruction of the land, and a group of Wisconsin artists created their interpretations of the Environmental Impact Statement for the Penokee Hills. Filmmaker Paulette Moore and a group of students from Eastern Mennonite University also created a docu­mentary about the proposed mine called To Wisconsin with Love that incorporates poetry and interviews with area residents. Due in part to the efforts of activ­ists, poets, musicians, and members of the entire community, Gogebic Taco­nite cancelled their Penokee Hills mine proposal in February of 2015. Without question, poetry can create change. I, for one, am a living testament to this fact. Poetry does not change the world all by itself. What a poem can do is incite an internal shift in the heart of just one listener/reader and that one person can go forward into the world to do great things. Nixon knows that in that moment, the poem changed him. It led him to other poets like Langston Hughes, Miguel Pinero, and poets from the Black Arts Movement. Eventually, after he had started to write his own poetry and moved to Milwaukee, Nixon began a reading series called Poetry Unplugged that provided a forum for many local poets to share their voices and their craft from 2003 to 2014. Most recently Nixon has been working with activist Muhibb Dyer and others on a campaign called I Will Not Die Young that aims to change the negative statis­tics associated with growing up black and male in our inner cities. Nixon and Muhibb use spoken word poetry, listening skills, and leadership training to reach out to boys and teach them that there is more to life than the block they live on. Poetry is a spiritual practice. The Overpass Light Brigade began in the winter of 2011 during the recall election for Governor Scott Walker and has since been recreated in fifty chap­ters all around the U.S. and Europe. The premise—and often the message—is quite simple. Participants stand together in a public space and each hold an illuminated letter to form words and phrases that speak to important issues: Water is Life, Poetic Justice, Unlearn Racism, Be Visible. This notion of performative text is key to understanding how poetry can change us. Through performance, and the greater context in which the words exist, the text becomes a very sacred kind of a poem: a guide post, a ritual, a spiritual endeavor. Racine poet Nick Demske talks about poetry as a spiritual endeavor. Demske, another Wisconsin poet who is an orga­nizer for 100TPC, works at the Racine Public Library. He’s the creative force behind the high-energy performance series called Bonk!, now entering its eighth year. “We need to remind each other that more is possible than what our eyes tell us,” says the indefatigable Demske. “We need to conspire—to breathe together—and, in so doing, inspire. Of course, I’ve only scratched the surface here. There are many more poets out there, all over Wisconsin, doing important, relevant work. I was not able to include everyone in this piece. By the time these words appear, many more things will have started. More lights will glow, new songs will be sung. The more light we have, the clearer the picture becomes. We know what we have to do. We have the power to create a better future. We just have to turn on the lights together, one poem at a time.